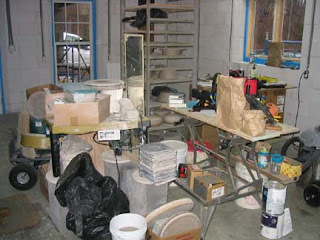 Another potter and blogger Michael Kline posted a before and after shot of his studio in progress this week. It made me remember this shot we took of my studio in progress. That's my wheel on the left with the cardboard box and the tupperware with the green lid. The mirror was taped to the front so that I could see what I was working on. You can't really see much else in this shot, but believe me, it was all this full of crap. 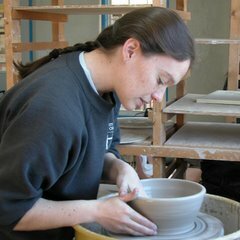 But I had to get some pots made anyway, so I did. I'm so glad it didn't last long. Only two years!